I recently came across “The real impact of high transportation costs” from CSCMP’s Supply Chain Quarterly. I found their three main drivers on how high transportation costs are affecting supply chain strategies were very accurate, with one critical packaging element absent. A shift from product design for marketability and production to design for "shipability"
In my day-to-day work on Packaging Optimization for our customers, the first two drivers challenge our clients with increasing frequency and intensity. There is a trend towards less overseas manufacturing or at least postponed assembly. There is also clearly a conscious effort for almost all companies to make their product and packaging more dense. This has a ripple effect of savings in their supply chain and logistics specifically in efficiency gained through packaging materials, handling and warehousing. What stood out to me as missing from the article’s “Shipability point,” and what I often see overlooked by some of our clients, is that shipability goes beyond on the size and shape of packaging. Shipability should also include the product’s ability to survive the supply chain. No matter how dense a product packs and ships as it fills out the perfect cube for your pallet or trailer load, if it is damage during the final mile before your customer gets it, the process failed. Your product and package must work in concert to survive the rigors of your ever-changing supply chain. Here is a simple equation demonstrating this point. If your product plus the packaging are greater than the rigors of your supply chain you are probably over spending on your packaging. If less, then you are going to see higher than normal damage rates. It is evident there is a shift towards more single parcel shipments to end customers, which is causing many companies’ supply chain equations to fall out of balance. Most packaging is designed for palletized shipment and is being asked to survive single parcel challenges. You can change any of the three variables in the equation (product, package or environment), but the distribution piece is often the most difficult and costly to change. Companies that rely solely on supplemental packaging as the solution to this problem overlook the possibility of simple improvements to make their products more robust that can be more cost effective than adding packaging. We recently completed a project that is a classic example of this. A customer with a domestically sourced product shifted from palletized delivery to a single parcel environment. The team created a solution that incorporated small product improvements with engineered packaging designs to meet all out-of-box customer requirements while reducing packaging and damage costs. Chainalytics will co-present this “Story of the Mojo” with Stratsys at the upcoming 2014 ISTA TransPack forum on April 23rd. Check back here for more details and follow up to this story after the conference concludes. I love business more than anything I think. I love seeing how A will drastically affect B for better or worse. No where is this more relevant than in the shipping and packaging field of business. 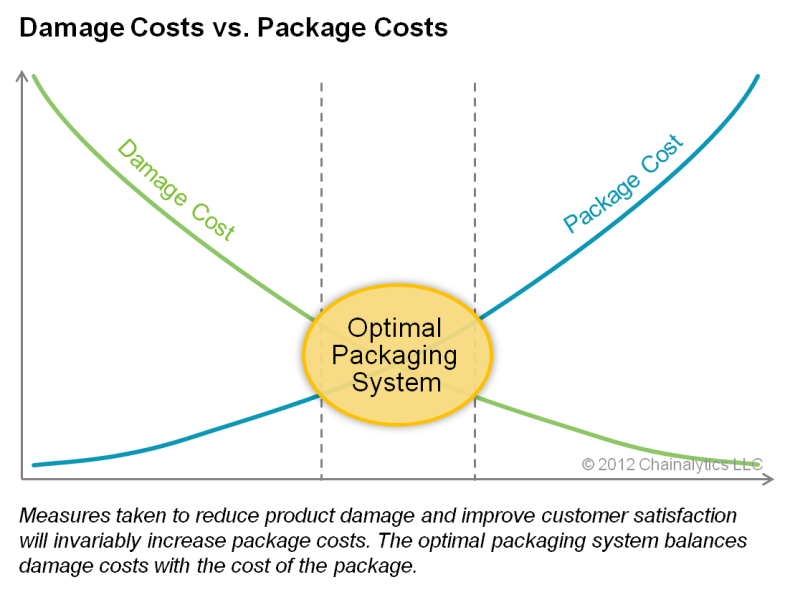 I like how your packaging graph closely resembles a cost and firm supply curve. There are so many uses for economics in making decisions. Even with packaging materials, you need to decide what method will be most economical and will best serve your customers.